I often teach Agile to people who have nothing to do with software development, such as leadership teams or organisations that operate entirely outside of the digital world. In this context I only teach the Modern Agile values (read more about the modern agile movement at modernagile.org). I always liked that the traditional agile values are accompanied by a number of principles but found that people outside of software development often have difficulty relating to them. For those situations I have adapted the 12 agile principles to be relevant outside of software development and have aligned them with the Modern Agile values. 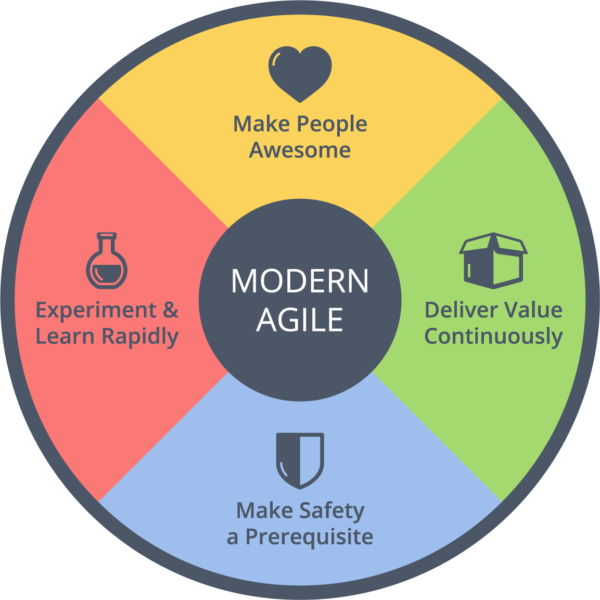 I refer to them as "Modern Agile Principles." Download your copy of printable cards: Double-sided printing or single-sided printing. Give each participant a set of cards. Ask them to work in pairs and to pick two principles between them. Have them discuss the principles they have chosen: What do they mean? What would they look like in their context? What practices support them? What habits inhibit them? Choose one of the principles and deep dive into what it means in their context, how well they are doing in this area and what they could do to get better at following it. If you’d like your own set download the pdf here (then print double-sided with long-edge binding, cut and laminate) or here for the single-sided version. If you use these Modern Agile Principle cards - I'd love to hear about your experiences and feedback. If you're looking for the traditional principle cards Anthony Boobier has shared them in an earlier blog post.